I couldn't find a thread for Freewheelers/Bootleggers yet. Others are more knowledgeable than me: I think, the company until three years ago was called Bootleggers and then for some reason changed their name to Freewheelers. 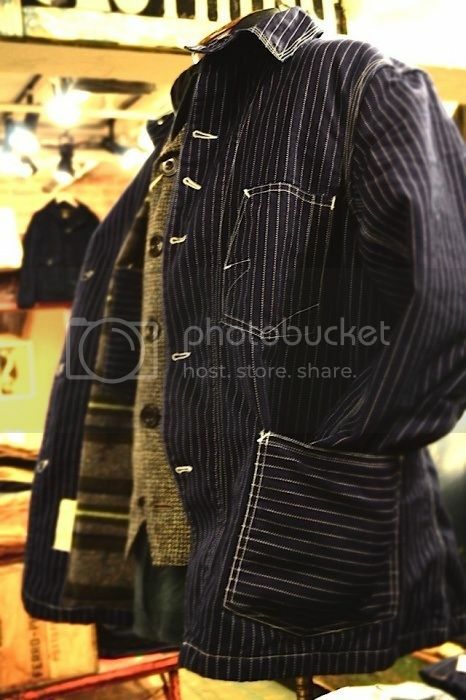 I am digging this new version of the Ironalls jacket with wabash fabric. The wool lining makes it versatile too. That lined wabash jacket looks goooood. Freewheelers is an incredible brand, and becoming one of my favorites. Their catalog is *incredibly* deep, and each piece is so detailed. The themed sub-brands all nail their own style perfectly. There's half a dozen amazing details in this shot alone, and probably more that keener eyes than mine can spot. 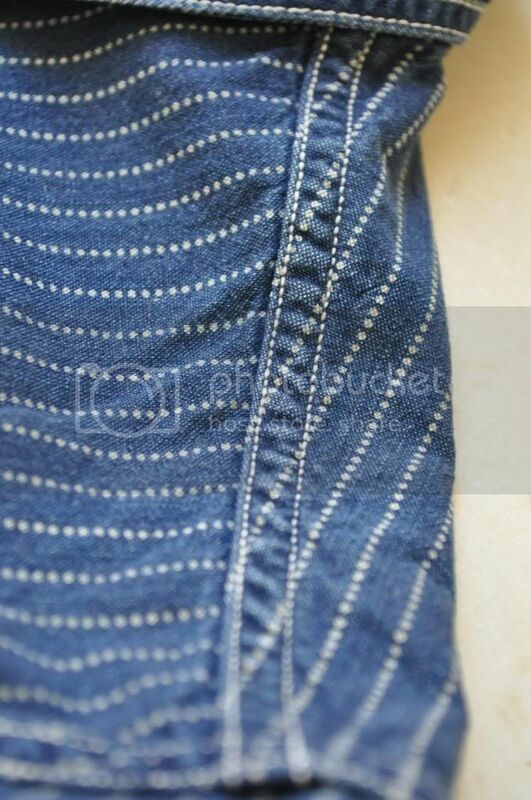 Freewheelers produces amzing pants and trousers. 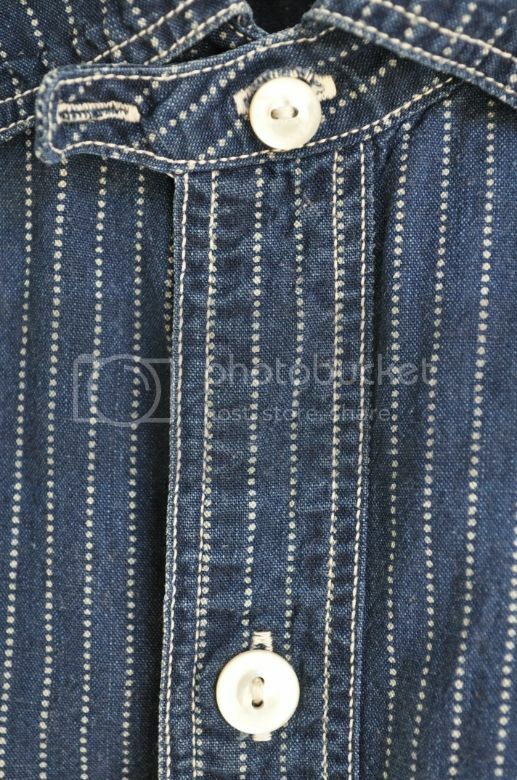 I really like how the denim Longshoreman has double chainstitched wasitband and the stitch per inch is high. It looks like single-needle stitched. 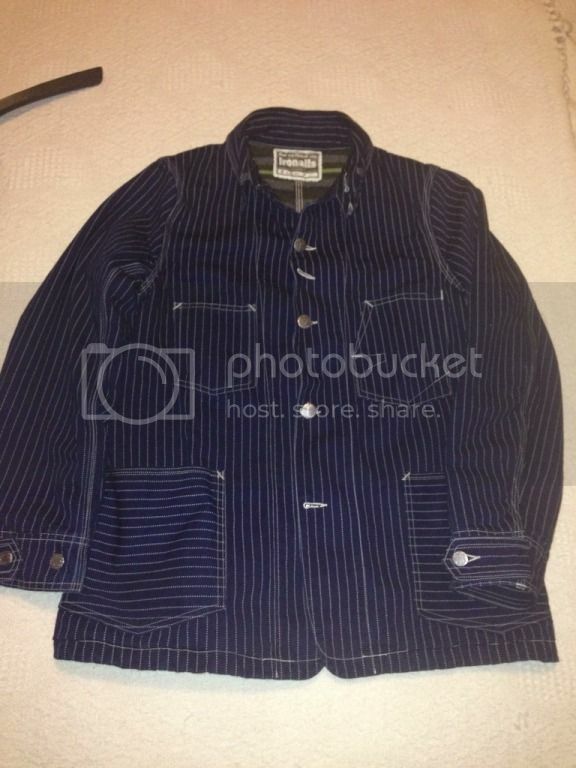 Where did you find the Ironalls jacket with wabash fabric - Is it for sale? IE, thanks for starting what promises to be a great thread. 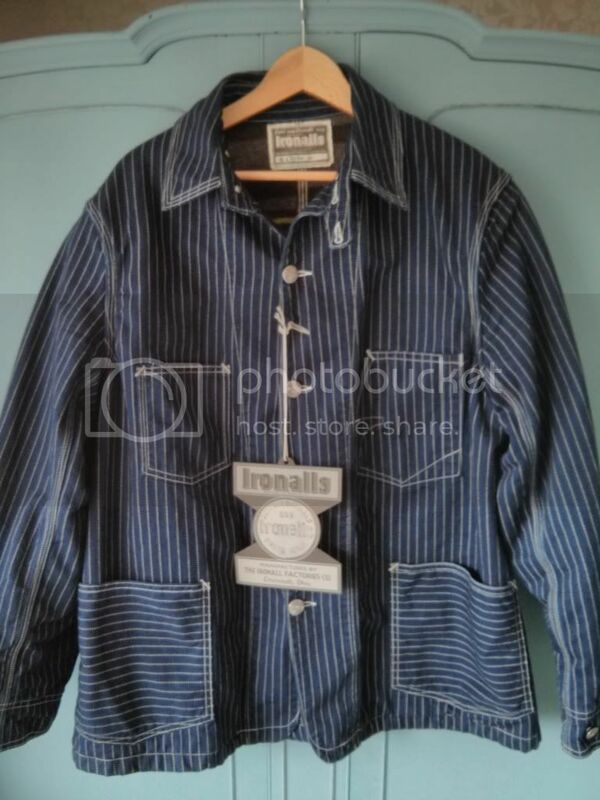 The Ironalls jacket looks fantastic. Where did you buy that beauty from? 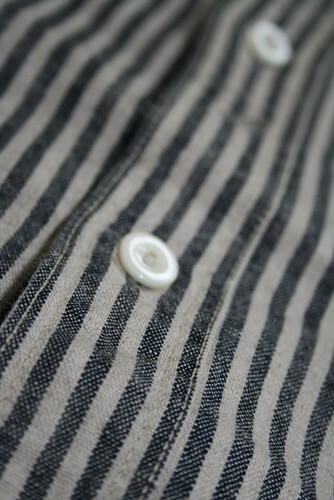 I love linen/ cotton blends. Can you post up measurements for that when you have a chance? 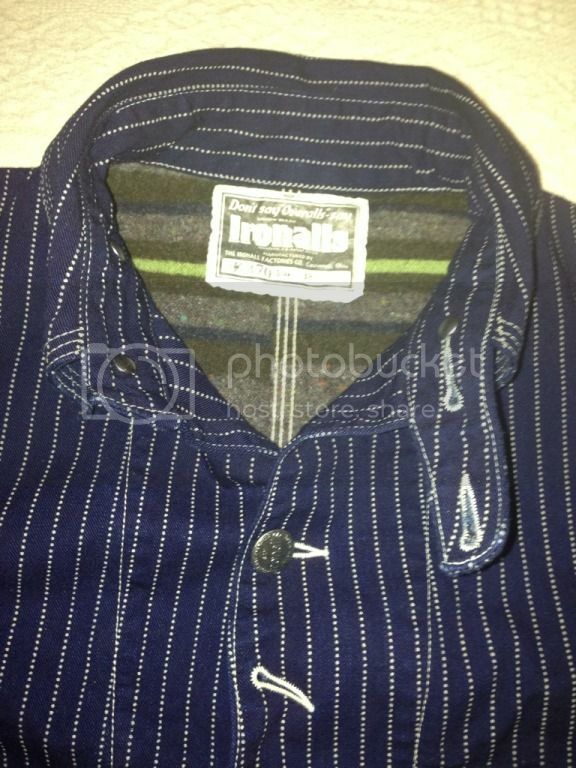 i have made enquires about the Ironalls jacket in japan. i'll update once i get info (John Loftgren is helping). I had a chance to try this coat on at Desolation Row. Awesome silhouette. A few shops took delivery of the wabash Ironalls jacket. We should see pics in the next couple days. The price is ¥54,600. That shirt looks great. 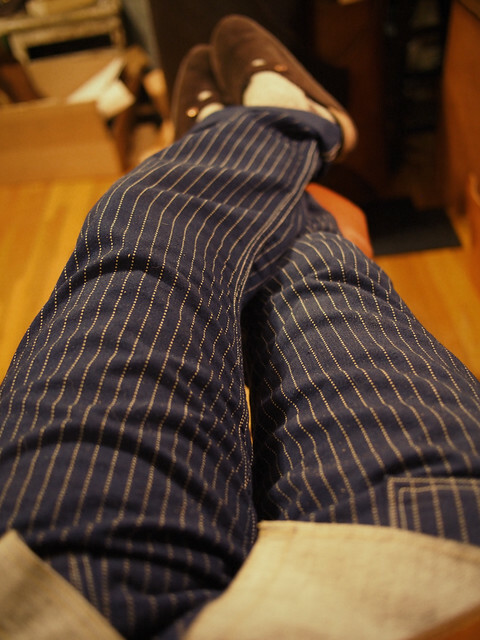 I'm lounging and working this evening in double Freewheelers with the wabash pants and white pepper shirt. Can we get a fit picture on those free wheeler wabash pants? Hah, sorry, I'll try to get a proper shot soon. I owe a lot of fit pics now, maybe I'll try to cram it all into one outfit tomorrow. 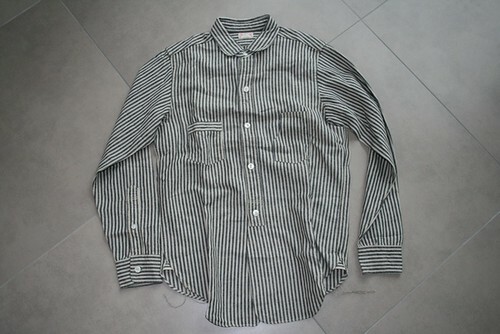 anyone own the stars wabash shirt from freewheelers? if it wasn't for the price I'd already have bought it. Those pants fit way better than the pictures on Japanese sites. Freewheelers trousers have very smart silhouette. It's hard to see that on Japanese sites, partly because they tend to size up. Slab, I have the star wabash locomotive shirt. 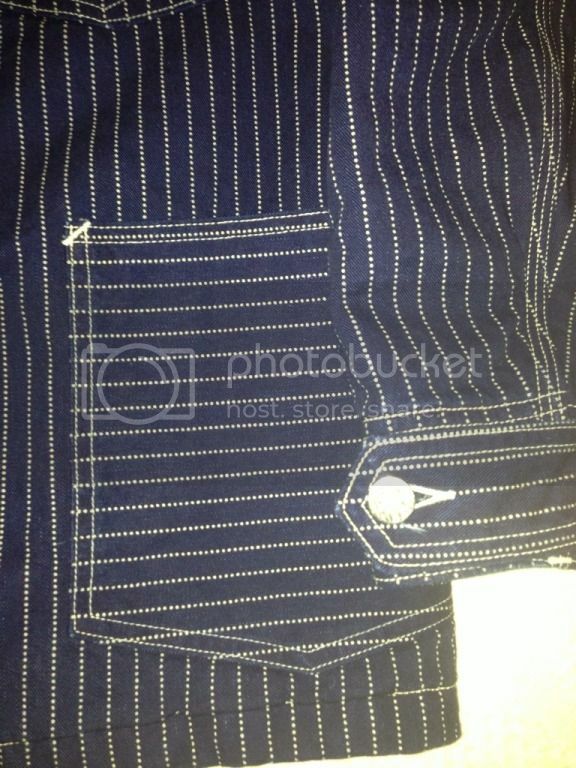 I will take a side by side shot of the fabric with the dot wabash. 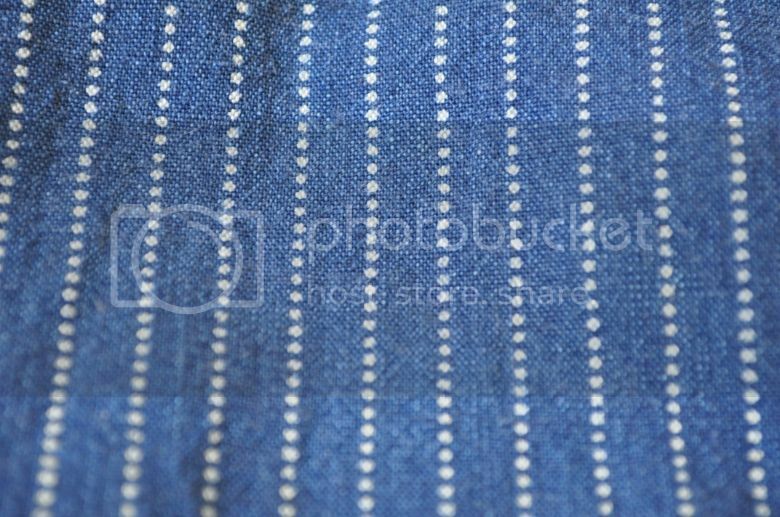 Also don't overlook the indigo coral stripe fabric. It is very unique and very comfortable. great comparison shots Snake, thanks! Freewheelers lists both of those shirts as part of their permanent collection so should be restocked. Hey snake what Shirt were you wearing at Inspiration ? 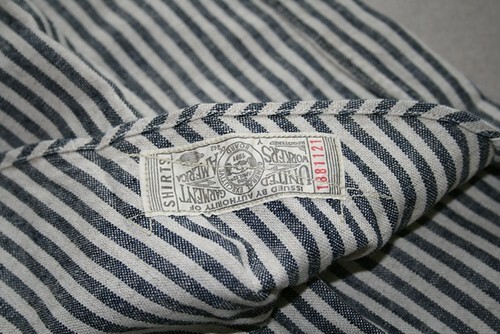 I was wearing the DeltaBlues shirt in grained random stripe chambray. 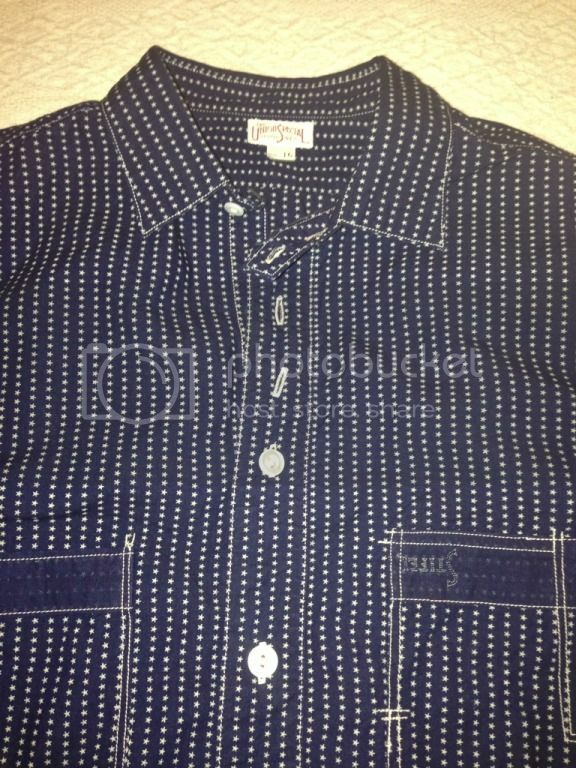 The fabric is similar to the white pepper chambray except I don't think it is a selvedge fabric. 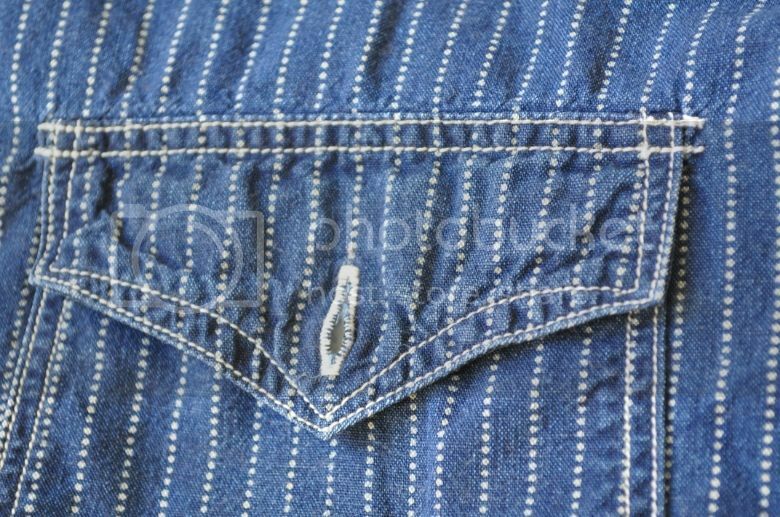 The gusset and sleeve do not have selvedge detail. They come in navy and grey as well. thank you love the shirt and the jacket. awesome purchase. I was originally looking at the Brakeman Coat but decided to go with Four Corners because of the shorter length, the sports coat collar detail and the halfbelt back. 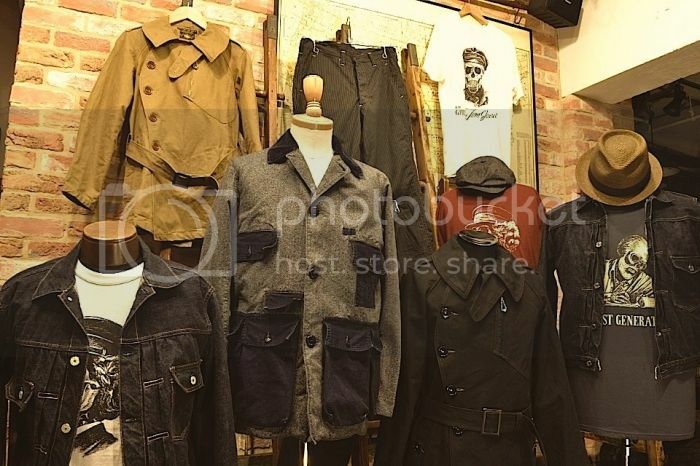 Anyone have the Brakeman Coat in Black or Auburn horsehide? Would like feedback on ti, pics if you have 'em. 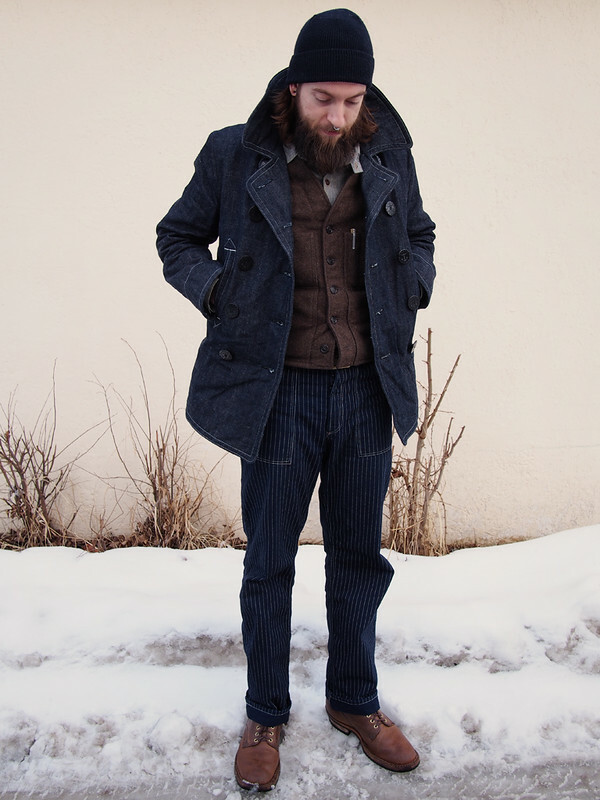 The Brakeman Coat only comes in Canyon Brown and Black. The color Canyon Brown has changed over the years though. Also, FW Exhibition is next week. Hopefully we see some pics on their blog soon. Yeah, it does look nice on that guy. One thing I noticed is that the Auburn version has much nicer buttons than the black version. 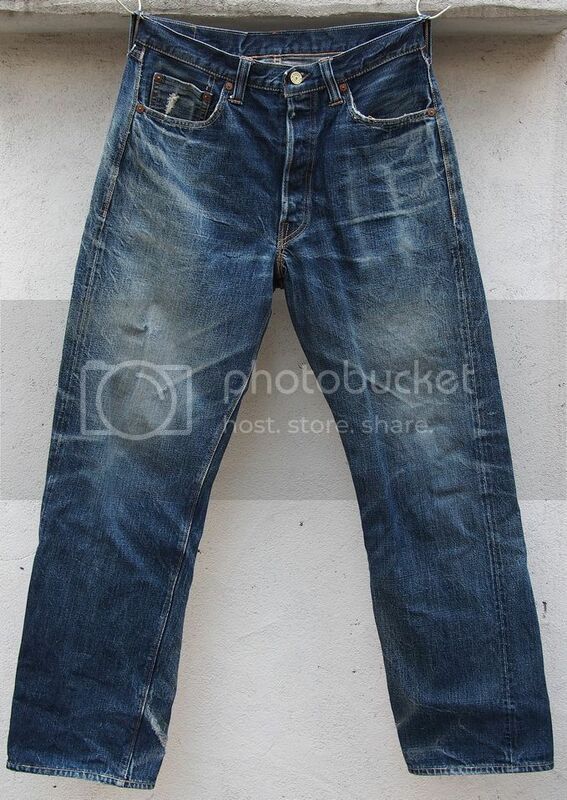 Not sure if this is common knowledge but the Dust Bowl is not an original FW design. It is a repro of a leather coat in their archive. Curtiss is a repro of a Spalding aviator coat from the 20s. great picks John; did you have those already or just got them? 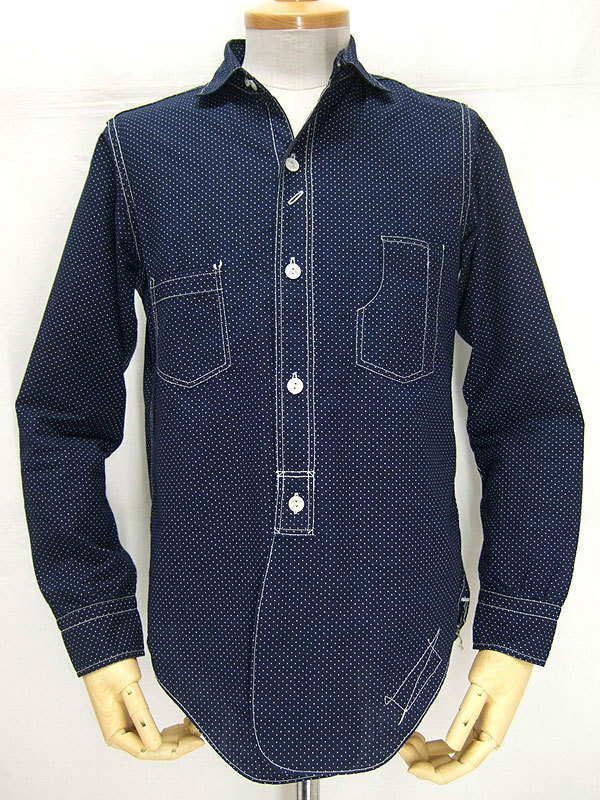 s/s 2013 up now on the Freewheelers blog, some good looking stuff. No surprise. Liking the jackets and vests. 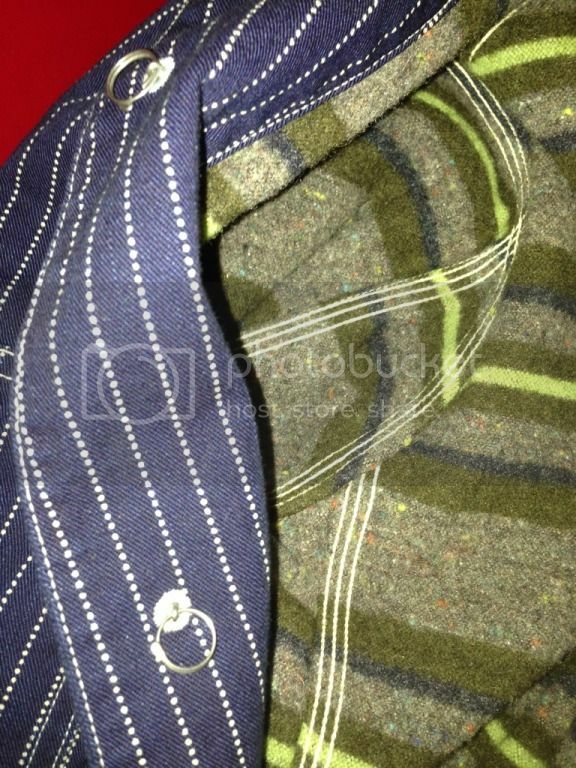 Hard to tell what's what, but it looks like there's some deerskin, moleskin, and linen in there. The black deerskin sport coat (Guthrie) looks awesome. The new lightning arc is interesting. I also like the Giants of the Dead series with references to Hemingway/Lost Generation and Tom Joad of Grapes of Wrath by Steinbeck. 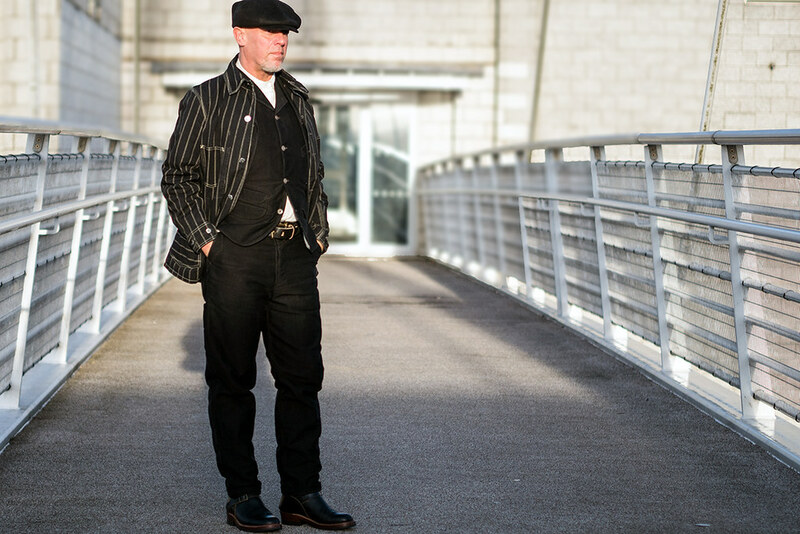 What do you think of the Freewheelers' version of the type 1 and 2 denim jackets? Boxy fit as with the traditional or more fitted? I think these items have not been sent to the shops yet. 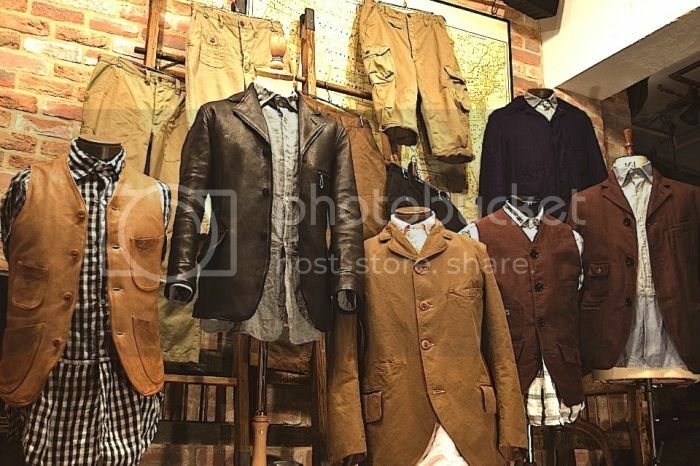 We'll probably see more pics on shops' blogs in the next days. All these items are not available yet. They should hit the stores between now and May. 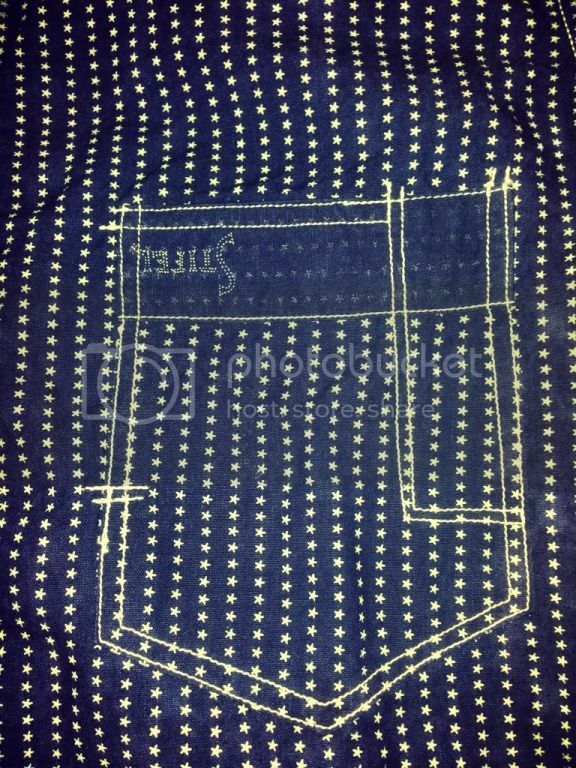 The type I and type II denim jackets should be available late March or early April. It's hard to tell the fit without looking at the actual measurements. 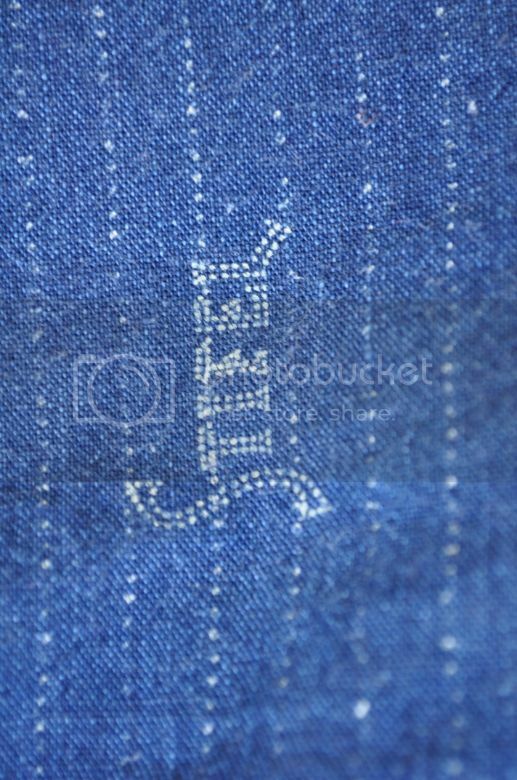 The stitching should be similar to original. I highly doubt FW will go with grey or white stitching. Probably more like yellow/orange. love the deerskin sports coat and some of those tees. I often look at stuff you are selling and wish it was bigger. The Freewheelers studded Engineer Boots are available now (not sure when they came out). It says that it's a cooperation with IrregulR which if I'm not mistaken is a company by Zip Stevenson (Stevenson Overall Co.). It seems that real vintage boots were used and refurbished and improved upon (not so sure about that from the text, though). Yup, a collab with Zip Stevenson. They came out about a month ago. The boots were mostly 80s Red Wing Engineer Boots. I'm very partial to Zip's sole work. That double riveted sole is the closest, for my money, that you can get to a vintage repair job (I've had too many pairs repaired by him). Anyone planning on purchasing a pair? lovely jacket; warm enough for chilly days? Temp is 43 is Brooklyn today and I am very comfortable in it. Both look great on you. 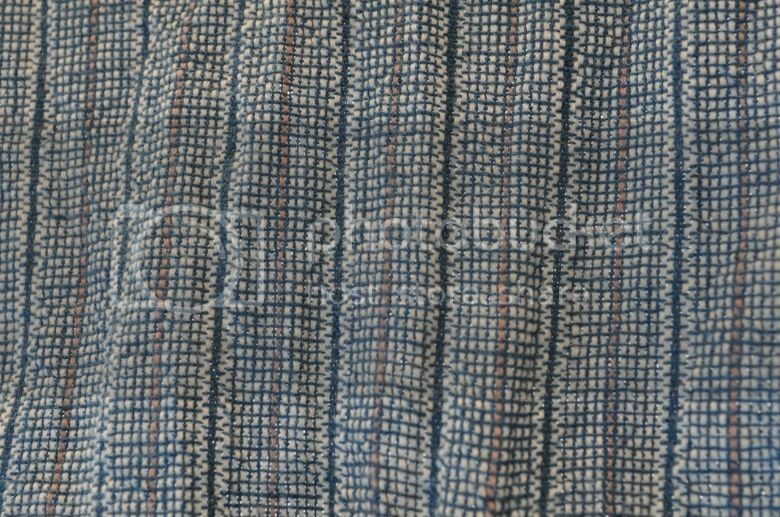 What you think of the beach cloth fabric? Looking good Lefty. I had a chance to try on the FW beach cloth jacket. It was great. Nice stretchiness to it. It seemed to "vacuum" around me as I buttoned it up, if that makes sense. They both suit you very well. 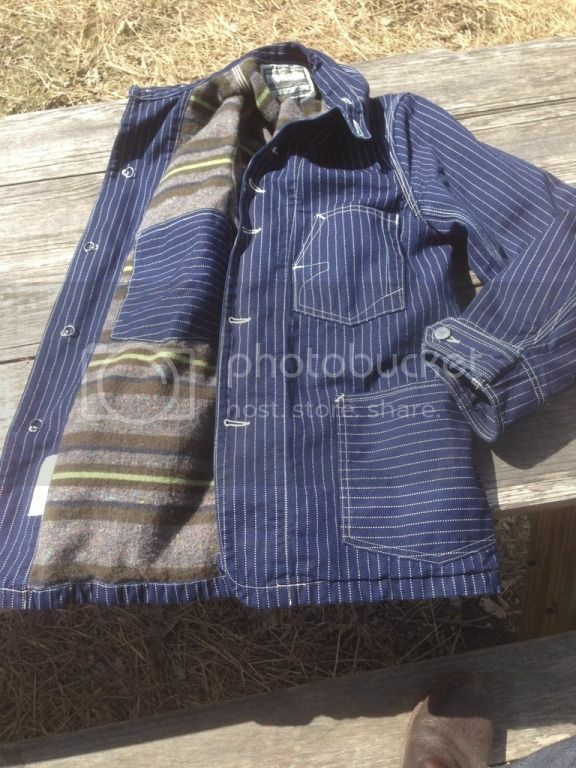 I love the brown's beach cloth of the Freewheelers Hemingway coat and vest. That is a beeeeautiful jacket man. It's actually still a bit too cold here for that coat around -2C. Even though the fabric is 90%wool it needs be to a few degrees warmer. I was wearing it a few days ago and was freezing. Plus my little digital camera seems to be giving up the ghost: pics some out overexposed and often with weird lines. But I'll see to it that I make some once it's warmer again. That jacket is a true beauty indigoeagle, great purchase. Beutiful jacket IE, hope you get some chances to wear it! Anybody got their eye on any of the soon to appear FW items? I'm really liking the bib shirt under the jacket on the far right. 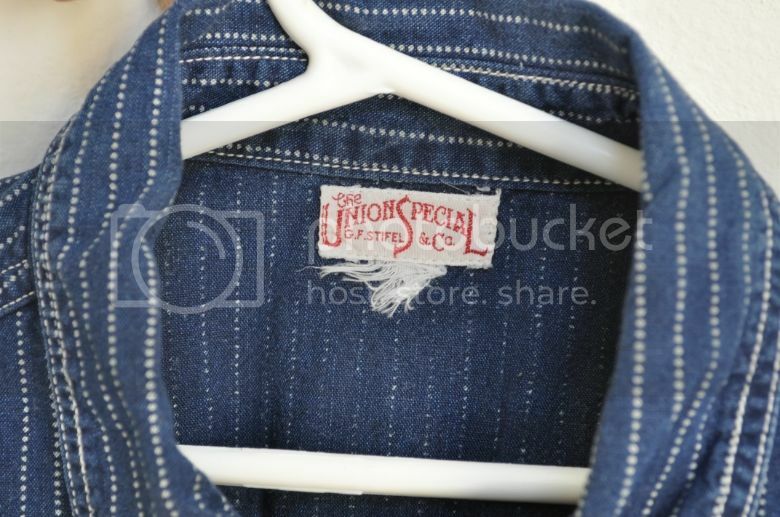 And also the denim jacket on the far right of this shot. I like the type I denim jacket as well. I also like shirt underneath the red vest. I don't see the placket so that must be the bib pullover shirt. The trouser next the Tom Joad t-shirt looks interesting as well. The 66MJ is nice, but I think I prefer the jacket pictured on the far right of the picture above. 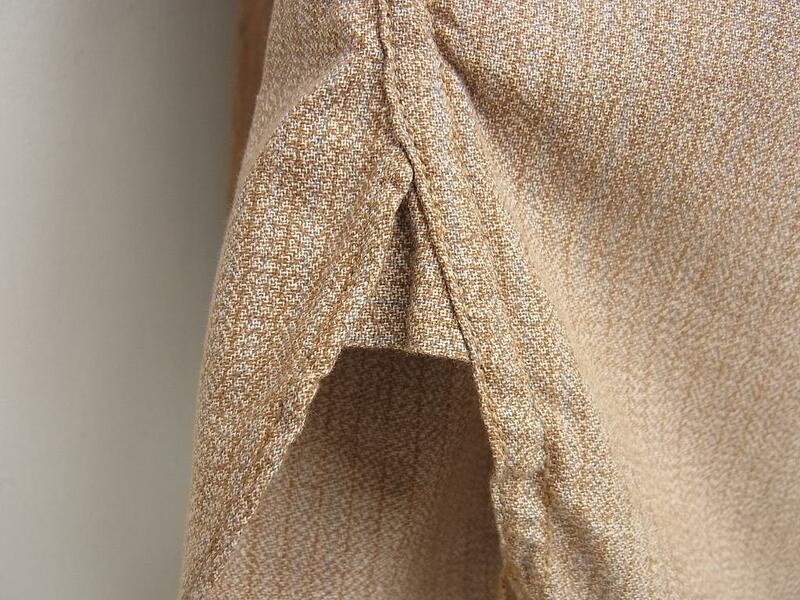 Not sure which of the following it is, but I like the single pocket and whatever those things are called over the pleats. Really excited to see the bib shirt. The one on the right should be the Lot 506, the one on the left the 507. Traditionally the type I and II jackets are boxy and have a wide cut compared to the type III trucker jacket which is very fitted. I'm wondering what thew FWs version will look like. IE, thanks for the breakdown. Hard to tell on the mannequin, but the 506 on the right looks pretty trim, no? I think they are on the boxy side. Looks like wide shoulder and short torso. You can stop by one of FW shops, they will show you the upcoming catalog and pictures from the exhibition. I am not sure if Desolation Row do that but I have seen a number of shops invite customers to stop by to check out upcoming FW collection. Thanks man. "Cal" at the DR shop has shown me pics of upcoming items before. They have an Ipad at the desk with images of their to be released stuff. Indeed, I'll have to give them a visit. Yes, it looks pretty trim. Would be great to see some pics of their exhibition. I'm wondering whether they'll offer it in rigid. For lot 66MJ, most shops only carry the one wash version. I wanted raw and the shop had to special request it. Those FW exhibition pics and catalog are like top secret classified files at the pentagon. FW only allows shops to show them if you physically visit the shops. 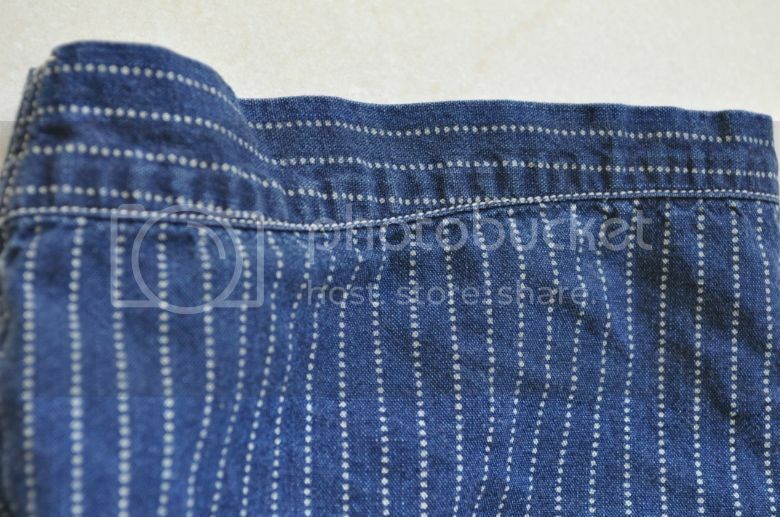 BRYMB used to put up decent descriptions of upcoming FW items without pics on their blog but was told by FW not to do that anymore. Through which shop did you order? What or who is BRYMB? Fuji from thewildone.jp place the order for me. Hopefully it will be here in a few weeks. Ah, thanks Yes, I remember that you had posted a link to that blog before. Interesting shop name: Buraiub. Fuji is a cool and helpful guy. I talked to him recently. He said he didn't order the denim jackets. But I guess he could still get them from FWs. He said that they're of a wider fit, not slim. That's beautiful. 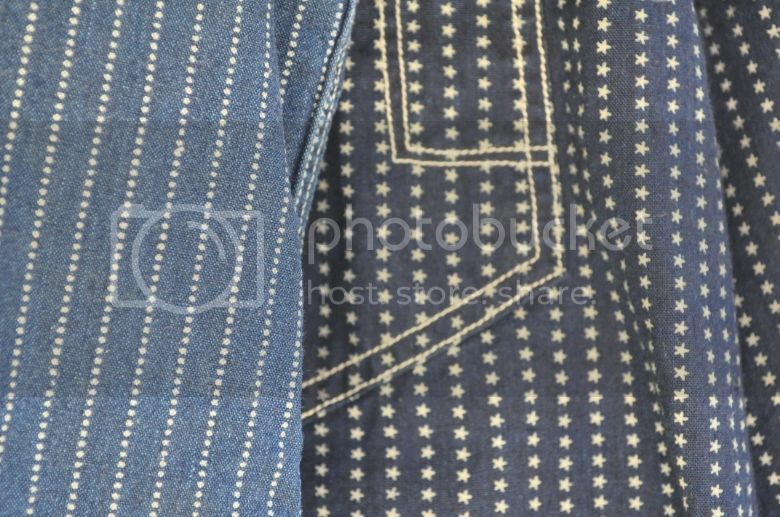 Really like the stitching on the pocket, and the colors of the blanket lining. I can't say enough good things about the quality of this jacket. If Mister Freedom is a gold standard this is ip to same standard. 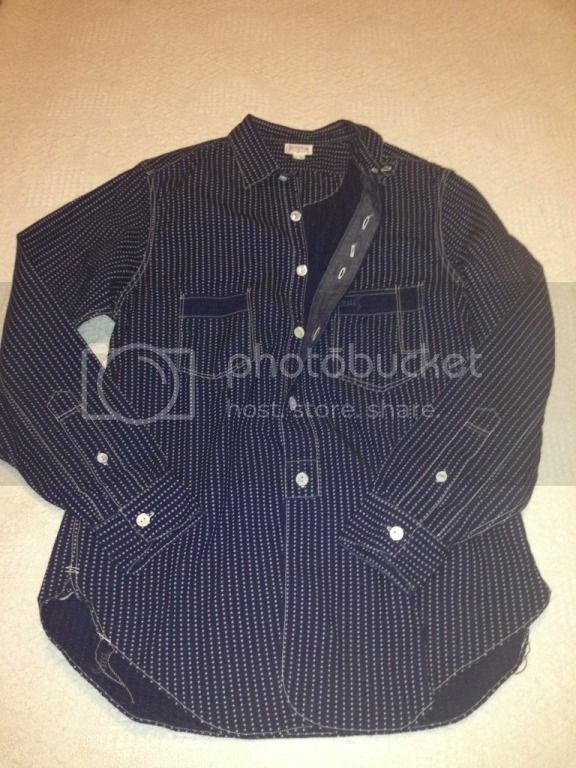 Anyone know if any shops still have this shirt in a 15/ medium? I wear a 38/ medium in MF so I figured this was the size I'd need. Check with John at Speedway. He can get most Freewheeler's stuff. I have special ordered a few pieces. 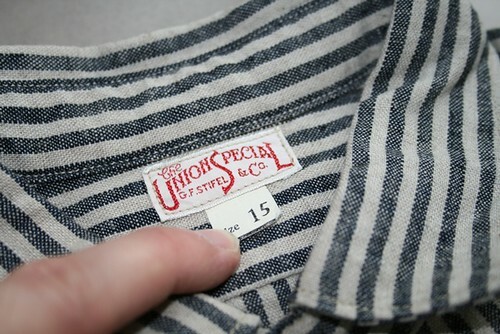 I have that trackwaker ss shirt in size 16. It fits fairly slim. My 16's chest measures 53cm and shoulder measures 44cm. I think the shirt shrinks a little from those measurements posted on Porky's. I'd get in touch with Keiichi. He's always very helpful in providing accurate measurements.